Cholesterol is a big, bad monster that lives under your bed. A monster the media and “mainstream” nutrition organizations created. Now they have you running scared. There’s so much fear and confusion about this… and it’s leading millions of people to make TERRIBLE decisions for their health. So let’s pull this monster out from under the bed and take a long, hard look at him. Is cholesterol really as scary as the media wants you to believe? Cholesterol might be “public enemy #1,” but it’s getting an unfair reputation. Bottom line: cholesterol is natural, and you NEED it to survive. This stuff is so important that your body actually MAKES it on its own! People in the mainstream media treat cholesterol like a villain, but it acts more like a friend. Flawed science and financial ties to “Big Pharma” kicked off the cholesterol smear campaign in the 1950s… and it’s been going strong ever since. This culture of fear helps drug companies sell more than $14 BILLION of cholesterol-lowering medication to over 24 million Americans each year. Doesn’t High Cholesterol Cause Heart Disease? But more and more evidence is coming out proving that simply isn’t true. 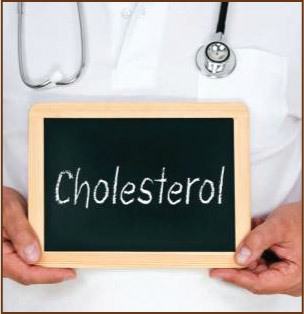 No study has shown a significant link between cholesterol and your risk of heart disease. Your total cholesterol levels—the ones most people worry about—aren’t connected to heart disease. The common thinking is that high levels of LDL increase your risk of heart disease, and high levels of HDL decrease it. But studies are coming out showing that this idea—that all LDL cholesterol is “bad”—is bogus. There are actually two types of LDL: 1) large, harmless types; and 2) small, dense types. You ONLY have to worry about small, dense LDL. The American Medical Association found that those are 3 times more likely to cause heart disease than large LDL. The “HDL is good” and “LDL is bad” idea is an easy way for drug companies to sell pills, but it’s misleading people about their health. The key to staying healthy: avoid small, dense LDL. The media urges you to avoid eating foods with high cholesterol (and saturated fat) like the plague. Swap eggs for egg whites. Skip the bacon and red meat. But Dr. Ronald Krauss found that eating this way increases the small, dense LDL in our blood. Following advice from “mainstream” health organizations puts you at risk of heart disease. It’s literally dangerous for your health! Researchers at the University of Connecticut found that people who ate three whole eggs a day lowered their small, dense LDL by an average of 18%. Don’t be scared of high-cholesterol food or saturated fats. Doing the exact OPPOSITE of what most nutrition guidelines recommend is the first step to better health. But that story is FICTION. You don’t have to buy it anymore. You don’t have to join the millions of people taking expensive (and dangerous) pills to lower their cholesterol—even though they would’ve been perfectly fine without them! And focus on eating healthy, delicious foods our ancestors ate for thousands of years. That's where Pete's Paleo Eats comes in.